Warm your belly with autumn soup and your soul with good company. It’s okay if you didn’t bring a dish to pass–we have enough here to feed any and all visitors. But before you dig in, let me tell you about this here community. We’re a cooperative group of bloggers. Oh, there are people out there in cyberspace who blog competitively, but they wouldn’t fit in here at my place. I like it when we ALL triumph. That’s why I’m offering an opportunity for my blogger-friends to improve their search ratings and reach out to new readers–DO put a link to your blog on this page. To read the guidelines Click here. Maybe you’re wondering whether my blogosphere can accurately be called a community. My Consise Oxford English Dictionary says the first definition for community is “a group of people living together in one place.” But we’re spread out all over the planet. I routinely revisit the same blogs where I feel as if I’m dropping in at an open house for a meet and greet, a wine-tasting, a soiree, or a coffee-clatch. I reconnect and make new connections. We share recipes, food/wine/travel experiences, frustrations, inspiration, and jokes. We even share stories about and pictures of our families. Perhaps the coolest thing about blogging parties is, they’re always going on whenever I have the time and inclination to go out, and no one minds–or even notices–if I show up with my hair mussed, wearing my jammies. Sheryl brought a delicious old-fashioned celery chowder. It’s a milky, homestyle kind of soup, just right for those of us who like to congregate at Sheryl’s blog, A Hundred Years Ago. We consider a slower-paced time as she daily posts her grandmother’s diary, written from 1911-1914 when her grandmother Helena was 15-19. History and geneology buffs, lovers of nostalgia, and people with farming roots or farming ancestors will want to show up at her gatherings. 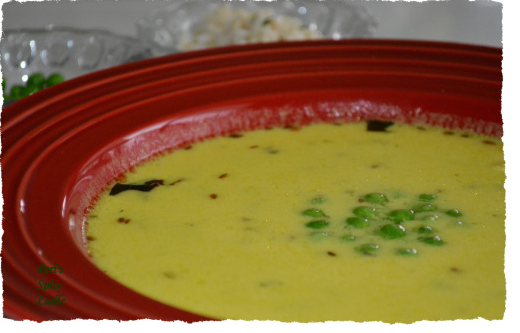 Peri is sharing an intriguing Kadhi-Yogurt Soup for those of us hooked on the delicious cuisine of India (warning: if you try this soup, you’ll likely become addicted to Peri’s food style). Peri’s Spice Ladle blog is where we who are devoted to healthy, flavorful eating gather to be inspired by her magical cuisine-wand. A native of Mumbai, India, now living in Texas, she adds inspired flavor to our everyday favorites and tweaks Indian classics to make them more accessible to home cooks world-wide. 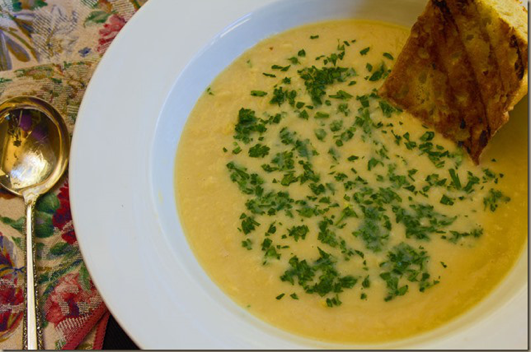 Dwight has brought this exquisite white bean and garlic soup from his blog Edible Arts, for us who love the guileless goodness of a simple preparation. Dwight is a certified wine specialist and a professor of philosophy at San Diego Mesa College. He blogs eloquently and thoughtfully about food and wine with professorial meanderings into ethics, political philosophy and aesthetics. We go there to become more conscious about why we’re in the kitchen and what we’re doing as home cooks, as well as to be inspired by the natural goodness and beauty of food and drink. Francesca from Flora’s Table has created this meltingly tasty Pumpkin soup. A native of Italy living with her photographer & wine-expert husband, Stefano Crosio, in New York, her blog is where home cooks devoted to fresh, wholesome ingredients and simple preparations find inspiration to create little kitchen masterpieces, always delicious and often with authentic Italian flare (and featuring Stefano’s beautiful photography). 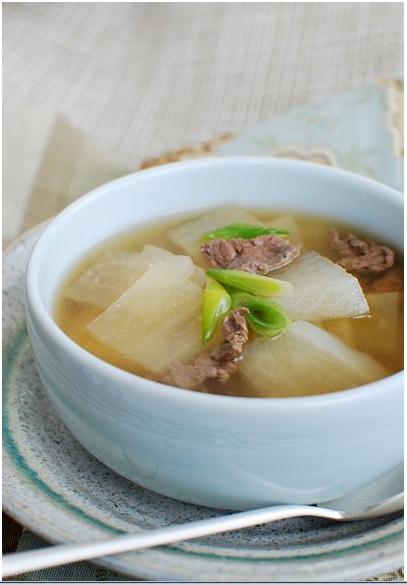 And Oliver is my German friend and my favorite Riesling-Fanatic, also known as the-Winegetter, He brought us this amazing Korean Radish Soup (with beef). We wine-lovers head over to Oliver’s place to chat and compare tasting notes (often about his beloved Rieslings) and to vicariously enjoy the frequent globe-trotting jaunts he takes with his lovely wife, Nina. Now, you all enjoy the party–taste and mingle. Introduce yourselves to each other while I go get the beverages and glasses. In the comments, please link to your blog and give a short description of what goes on at your place. If you’re excessively shy, just tell us your blog name, where you blog from (be as specific or general as you want) and link to your home page. I’ll be looking for all of you at future parties hosted by the fantastic members of my blogging community. Because I can’t think of a better word for our coming-together than community. Can you? Get this: cyber-space often becomes physical space. I’ve just learned that some of my blogger-buddies (mentioned above) are meeting in Philly for a weekend get-together–how cool is that? Francesca from http://florastable.com/ ; Stefano from http://clicksandcorks.com/ ; Oliver from http://thewinegetter.com/ ; and Jeff from http://thedrunkencyclist.com/ . Have a blast you guys! Looking forward to the day I can join you! It looks like we’re having two separate get togethers at this point. But still exciting! What a wonderful post and especially concept, Tracy! Way to go and hat’s off to you for coming up with this joint effort, think tank, cooperation, community idea! Well done. We need to make it happen in Rhode Island too! You’re quite welcome. And I’m glad you saw this for what it is–my attempt to showcase community and cooperation. I don’t know why it has taken me so long to tap back into the very thing that has always come naturally to me. I’ve always had a knack for focusing a team effort so that everyone wins. I am ever-aware of the inter-connectedness of everything that happens; it’s blatantly clear to me nobody accomplishes anything entirely alone (even though some people’s special talent seems to be to hog the credit). Well, actually, I do know why it took so long. It was my health, which for 17 years has been necessarily taking a HUGE chunk of my time and attention. But this past year I’ve made a huge breakthrough in recovering my strength and endurance, and also I’ve discovered how to “work” with people online, which makes it possible for me to collaborate again. And yes, we’ll make it happen a get-together happen in Rhode Island, too. I’ll be messaging you on that in a few months. I have some groovy ideas! 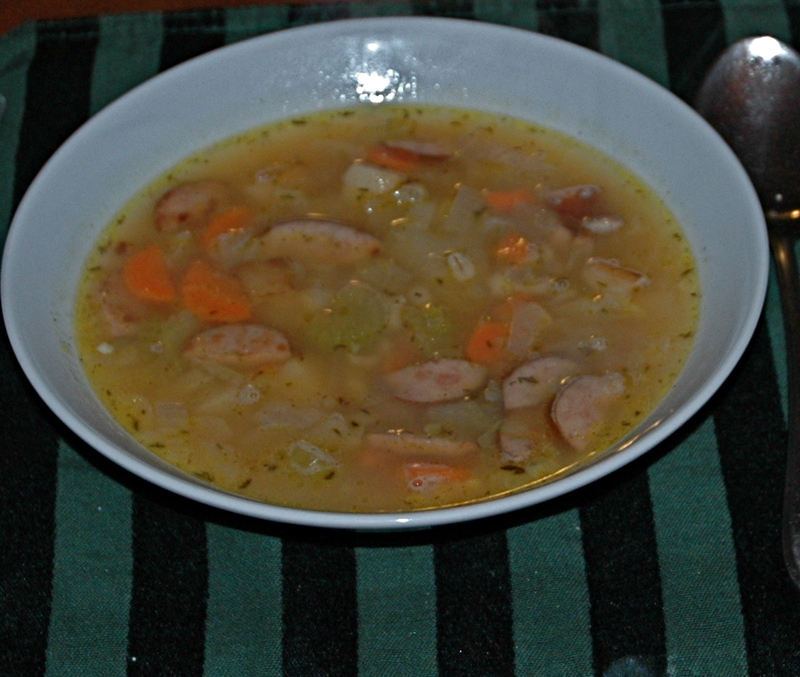 Your post reflects one of my favorite things about autumn, cooking soups in my crock pot. They all look delicious, but I’m a big fan of white bean soup. So am I, and I love the simplicity of this one! First you provide me with delicious soup recipes and now you mention my blog, you’re too kind, Tracy. Have a wonderful weekend! Tracy, what a wonderful post and it mirrors my feelings regarding dropping in on friends. It’s just marvelous. Thanks so much for including me! While I have frequented the parties at Peri and Francesca’s, I was new to Sheryl and Dwight. Exciting blogs, and I am so glad I found them through you!! And as always, thanks for your kind words! I’m thinking about doing something like this every couple of months. Next time, probably a wine and cheese tasting… I think it’s fun to see who other people are reading, and I’ve found some of my favorite bloggers because they’ve hung out at other bloggers’ places. The soups are simple and delicious–perfect for suppers! Annie blogs with beautiful photography, I might add. Duluth is one of my old stomping grounds and I love revisiting it’s beautiful scenery through Annie’s pictures. Wonderful community soup supper post, Tracy. Your post is one of the welcoming, open door, come-as-you-are posts. Thank you. Thanks for stopping by, Marylin. What a great post! I love the idea – what are you serving as a beverage at this party? And all of the soups look and sound delish – I’ll have a sampling of each. I’m so happy to call you a friend! For those of you who don’t know me, I’m Captain from Cowboys and Crossbones. My feline side kick, Ted and I blog about our Nashville life, fun and all kinds of shenanigans in between! Beverages–whatever every each guest wants, that’s what she gets. Skinny Pirate coming right up for you! I met Captain in cyberspace while I was living near here in Nashville, but left town before we had an opportunity to connect in a reality place. I regret that! Tracy – your soup picture looked so wonderfully warming I was enticed in – and what a wonderfully metaphorical post you’ve created – a community is like a bowl of soup – plenty of different ingredients, mixed together to form interesting flavours and friendships: magical. I love parsnips. You (and Mum) have just inspired me to invent my own version of curried parsnip soup. I’ve recently bumped into her and am enjoying her warmth and wit. What a wonderful idea! This is definitely my idea of a good party 🙂 That’s probably one of the things I love most about blogging, the connections you make with other people. I love this collection of fall soups. We must have been thinking the same thing because just last weekend I made some wild rice soup in my crock pot. I’ve been wanting to try pumpkin or butternut squash soup so I might have use Francesca’s recipe. 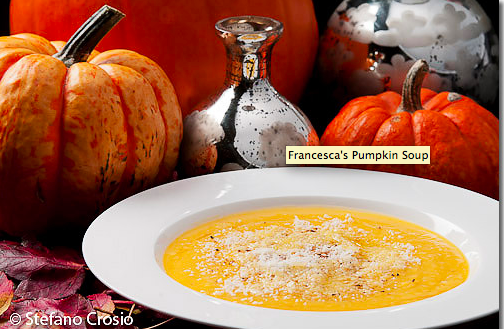 I just made Francesca’s pumpkin soup last night (you could make it with squash, too! ); it’s addictive-delicious! I have been dreaming of soup since the weather turned cooler. I haven’t gotten out my recipes yet…but soon. Every year there is a different one that I make obsessively. I wonder what it will be this year…. And let me add that she blogs about anything and everything in an outrageously fun, creative style. Thanks for stopping by Kate. See you soon at your place. Soup is among my favorite autumn meals, too, J.
Tracy, Tracy, Tracy!!! This post is a such a little masterpiece. So well written and so nicely put! Your community is such an amazing group of people. We feel so honored to be included. Thank you so much!!! And thank you so much for your kind words about me, Stefano, our blogs and what we are trying to do. We’ll miss you in Philadelphia! Maybe next time? Definitely next time, dear Francesca. Yes, I believe we were and are meant to meet and I’m sure it will happen very soon. I’m camera-shy, too, so I totally understand. But surely you wouldn’t mind if Oliver took a picture of your hands, or one hand, or your shoe… just some little marker of your actual presence at the meeting? It’s the poet in me–always looking for something concrete and specific to identify that a person does exist… and is not just a mere daydream that I’ve wishfully imagined. And yeah, I guess I will have to drink more wine…thanks for encouraging me. It’s funny how we are similar like that, Tracy. It’s one of the reasons I have my photo gallery up in the About section of my blog. I want to see whom I am dealing with, so it’s natural, to me, to also share photos of what I look like…something concrete in this virtual space. I totally understand Francesca’s stance. I didn’t allow my photo to be taken or publicized until my children were well into adulthood. I was uncomfortable with my picture being public for my own reasons, but the fact that it might affect my children, was even stronger. The soups look wonderful. I make a soup recipe most week-ends during the cooler months of the year. I know that I’ll come back to this page from time to time to try some of these soups. I am honored that you thought it was worthy to include the old fashioned celery chowder in this post. Thanks for directing me to Francesca from Flora’s Table. Her Pumpkin soup is tempting, but I’m still trying to re-create one I had years ago that included dairy in the recipe. 🙂 The other recipes here look amazing as well. Does anyone have a chilled yogurt soup recipe? We had that at a restaurant (Paymon’s Mediterranean Café) in Las Vegas, Nevada. Wonderful. I’ve been hanging out at Judy’s place to travel down the corridors of her (fascinating!) mind: through travel, family and life stories. I’m especially intrigued by her most recent post about the role that Fort Ontario in Oswego NY played in sheltering European (mostly Jewish) refugees during WWII. 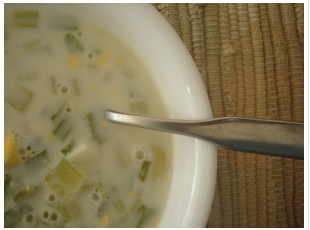 Thank you, Tracy, for adding the link to my blog and for the chilled yogurt soup recipe. It does appear to have many of the ingredients I remember. The pumpkin soup also was chilled. Lovely post. The soups are as warming as the community of friends who you enjoy reading. I’m looking forward to discovering some new blogs. I absolutely love her posts about her life and travels! Oh YUM! I’ve added Peri and Dwight’s blogs to my list of favorites. Thank you! My pleasure — I was thinking I had already told you about Peri. I always think of you when I read her blog! Tracy, I am still new to blogging. I found your link on my Mom’s blog (earth-rider.com). My blog is called My So Called Life Journey and you can find it at http://mysocalledlifejourney.wordpress.com I blog from Florida and mostly try to tell stories about the things that happen in my life. The soup recipes look really tasty, I may have to have my hubby make them for me. I hope you enjoy my blog. It’s wonderful to met you, Jenn. I always feel a deeper connection when I meet my friends’ families. Thank you so much for popping in and introducing yourself. I’m headed over to your place, right now. Tracy, what a wonderfully warming, welcoming and thoroughly delightful post. I love your spirit of community and the the way you bring us together to meet one another. What a lovely idea. Also, I adore soup so not only is this a marvellous way to introduce other bloggers but an absolutely delicious way to do so! I’m so pleased you stopped by, Sherri. I found your blog via The Winegetter and will be back to visit yours. Love the soups!